why no one speaks of constant attacks on journalist and media during Nasheed regime. Why these people never saw how V TV was attacked and how DhiTv was attacked. 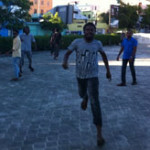 Why people had not seen, MNBC journalist was attacked, VTV , and Dhitv presenters and news reporters were attacked too. Why people never talk about how Nasheed had use the armed forces against the journalist and reporter and prevent them doing responsible journalism. Reporters without whatsoever can report on what is going on in America?? How much freedom the corporate media is letting on to the general public concerning the Boston Bombing?? The so called free press CNN, FOX and the lot is censoring any detail about the truth. Not surprising when everything is blamed on Muslims, ehh! Check youtube, RT- the truth seekers report on the Boston bombings hoax?? ?you'll get an idea of how the game is played!??? reporters without borders, my foot!!! You know the Gandhi's monkey's?practice that with this idiot called Hilath,he is simply evil, a manifestation of ages of evil thoughts present in our society.Don't think of any evil and there is no evil. My request from the scholars with some good intent is to simply avoid that ignorance.Avoid what doesn't concern us.Do not retaliate!We have to save the society from evil thoughts,thats our salvation nothing else.So avoid! avoid! avoid!- We know the way to salvation since times immemorial,we are the indian civilization, a civilization that never died and whose works where never truly destroyed by the Creator.No better quality of Love has ever existed anywhere.We may change our religion,scriptures,teachers and kings,but we never give up our cuture.After all we are sons and daugters of Ram,Ravan,the Budhdha,Akbar, you play with our culture?your civilization becomes extict,thats the wrold's history.Western influence through liberalism and globalization has become a menace in all lands of Hindh. "why no one speaks of constant attacks on journalist and media during Nasheed regime." I don't normally respond to your drivel. But seriously, dude, you need to get a life. Yes, a lot of crap happened during Nasheed's term in office. You can scream about them till the cows come home, but nothing's going to happen. This country needs to move forward. Nasheed was toppled by a coup d'etat. Regardless, his party is on a campaign for the upcoming Presidential elections. And every other politician seems to be on that route. We have Mr Waheed, who have discovered a new love for Maldivian people, out to visit the people. Every one with an ounce of intelligence knows that this is a campaign trail at taxpayer expense. So, in summary, there's lots to talk about past kings, queens, dictators, despots, autocrats, presidents and just down right vermin. But it's pointless. I have a lot to talk about how the people of Suvadheeb were murdered in cold blood and maimed for life by the ruthless vermin named Ibrahim Nasir. But I don't go out shouting about it everyday. And, yes, I don't like Nasheed one little bit for having given the ruthless vermin Ibrahim Nasir a state funeral! The guy was a murderer and a thief. But what's the point of going on about it? Absolutely no point. Let the country move forward. @Kuribee, it seems that you have personal grudge against Nasheed. To hell with you dude, please be cool and have positive thinking. Knowledge is freedom. Ignorance is bliss. How can these so called reporters without whatever get it so wrong? Used to think that pro journalists can read between the lines to the truth. The truth is that there was no coup. Waheed is not coup material. Anybody can say to the contrary to any number of times. But repeating a lie doesn't make it true. Whatever Anni is, he is not a coward. He didn't fear for his life. He has been persecuted under Maumoon many times. So if he was pressed to sign abdication from office at gun point, why didn't he say so on live tv when he resigned? Why did he only realize it was a coup after 24 hours? After that quickly arranged 'big meeting'? Couldn't he had gone straight to Indian embassy and take refuge there that same hour and call BBC and world media that he was forced from power? Why are we subjected to these lies day and night by this yellow media. IT gets tedious after sometime. Lying once in a while is ok, humans can and do lie, but making it an industry out of it is totally wrong. Truth is that we have close to nothing in terms of terrorism or extremism. The one and only time they exploded something, it was just a crude ied. Even the British called it an ied. But we, the silly dhivehins called it a bomb. We spread that news like it was a trophy. But what we were doing was just shooting our foot. Gayoom and religious extremists are ONE, hence PPM and Adhaalath are ONE. Gayoom disguises himself as as moderate and acts behind the scenes to fan the flames of hatred from extremists; if we need a decent society we may need to BAN both unless they act within civilized norms. I wonder Where were this Reportersxxxborder during Nasheeds Regime. He is the only president sent Military forces to the private TV and Radio Stations and asked us to stop broadcasting immediately. We were so scared that armed forces cam to our station during Nasheeds Regime and tried to scare us. Where were u Reportersxxxborders? Howmany times we have written this to you? Later on we have uploaded the security can video footage aswell. Only AFJ condemns the attack. This is well known. The survival of the extremists depend on it. Keep people in the dark, intimidated and scared out of their wits, if they dare so much as raise a question. 1) By knowledge, you can see whats happening within and elsewhere. You will then ask, why Japan and indonesia were struck with a Tsunami. Why Iran, UAE, Pakistan were struck with earth quakes? Why Bangladeshi building killed 500+? Why rain/typhoons/tornadoes ravage Phillipines / America / Bangldesh every year. You can see there is no relation to these disastrous events, with the religious beliefs and their piousness. The question the Camels are worried that their harem would ask is, why are we not excluded from these disasters, as ‘The Selected’? 2) Deep inside the mullahs KNOW they are howling at the moon. But if they acknowledge their own stupidity, they will get eaten raw by their followers for having led them by their noses for so long, on a useless wild goose chase. 3) They propose to use logic to everything, but conveniently forget to apply basic logic to their indescribably stupid base beliefs. Of course, even to stand upright, these guys need to limit knowledge, freedom, and basic human rights to the people! It has been too long for the media to express the fact that Maldives is already breeding ground of ‘extremism' by some Islamic groups! It is a fact that there are books of some Islamic teachers who believe that what they believe in is the only way being translated to the local language, distributed and taught in various places. Their students are also taught many things that go hand in hand with the belief. Also they are taught strict rules for living, communicating, executing, etc., etc.! Politicians, Religious Scholars and in fact the National Security cannot be unaware of these fact, I am quiet sure! There are some who wants this to flourish! Because at times of need, they can use them to fulfill their purpose, just like King Saud of Saudi Arabia used the Wahabis to make it his kingdom! There are also some who want this to be stopped before it is too late! Maldives has a culture which to an extend can be said is not too Islamic! This is a fact! But the fact is that a culture cannot be changed overnight! And it cannot be changed by the whip! It may be done through respectable education and belief!